The magical village of Playa Nosara is located on the Western Coast of Costa Rica. The area is lush with jungle flowers and trees and hosts abundant wildlife..howler monkeys, iguanas, toucans and parrots. The Nosara area includes three distinct beach areas, Playa Nosara, Playa Guiones and Playa Pelada where the house is located. There is a 300 ft easement from the beach to the house that is protected as a wildlife refuge so there is a 5 minute walk. Step through the trees and you find the most beautiful, quiet, white sand beach, great for swimming, beachcombing and sunbathing. A 5 minute walk over a hill and you'll find Playa Guiones, considered one of the best surf spots on the central peninsula. Within walking distance are great restaurants, ATV rentals, groceries and hotels. All the roads in and around Nosara are unpaved so Jeeps, ATV's and walking are the best methods of transportation. There are inexpensive local taxis (tuk tuks) available. For recreational needs there are several surf camps located in the town in addition to surf board rentals and private, daily surf instruction. Located just south of Playa Giones is the famous Nosara Yoga Institute which has regular classes and workshops. Horseback riding on the beach is available and there are two local monkey sanctuaries that can be visited. Ostional where you can watch the arrival of the turtles. Or if inactivity is more your desire, spread out your towel on the beautiful white sand beach and listen to the waves and the sea gulls or sit in a rocking chair on the verandah and sip local Tico beer. If you're looking for a culinary experience, the restaurants in Nosara are very high quality and reasonably affordable. The typical dish, Casados, of rice, beans, plantains and chicken, fish or beef is by far the freshest, best value. There are pizza restaurants, Asian influenced and European restaurants as well. 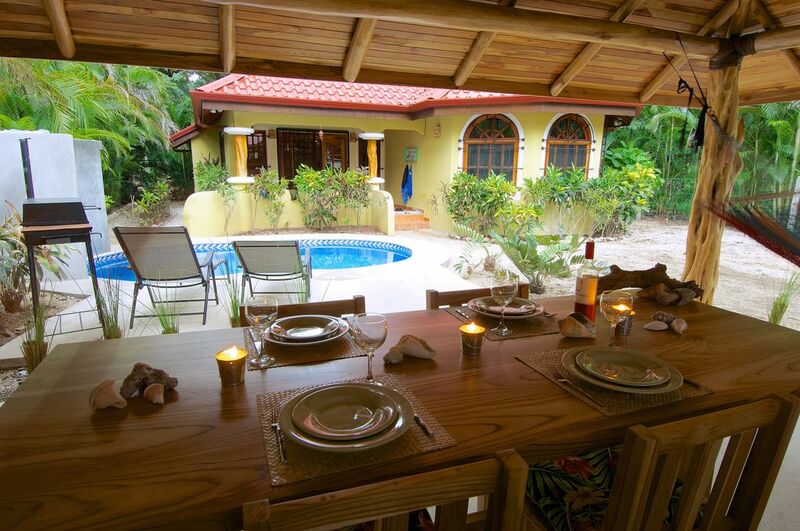 The house is well appointed with hand made solid teak furniture and bright fabrics. There are two bedrooms downstairs with a queen bed in one and a king size bed in the other bedroom and the upstairs loft has 2 twin beds. The kitchen is fully equipped with everything you need to prepare full gourmet meals or just whip up your mango and pineapple smoothies. There is a good sized combination safe in the closet so you needn't worry about your valuables. Beach towels are provided for your use. NEW: We are accepting long term rentals (30+ days) only at this time. Available as of July 1, 2019. Discounted monthly rates apply. Please send request for quote for more information. We live in Ottawa, Ontario, Canada and have been visiting Costa Rica annually for several years. We fell in love with the Nosara area and we are sure others will too! Table seats 6. Outdoor table seats 6 as well. There are 3 or 4 stairs to access the front door. Locks on the doors are also quite high. The pool is maintained and cleaned by the property management company. Amazing stay at Casa Paraisito! We enjoyed our stay in Paraisito very much. The house is so beautiful and spacious. Gorgeous wood everywhere and our kids lived in the pool which is small but clean and warm!! I loved the hammock out back!! Challenges were the elaborate security system- alarming the house and locking the gate each time we came and went was complicated. (Especially when kids forget things and we have to do the process all over again!!). Also, we loved the outdoor dining space but would have used it more if we had some plastic dishes etc. I was much too nervous (especially after one shattering event in the kitchen) to let my kids eat on glass over concrete outside. So that was a bummer. The second floor loft is great for kids (love the tan beds) but very hot even with the AC on full. The other challenge is that the house is isolated and you can't walk to anything other than the beach. We rented a "Jungle cart" and got around that way. Overall, we really enjoyed our time. Nosara is an amazing place! We had a fantastic time in Playa Pelada. Having arrived at night it was a rough start because it felt like we were far from everything. But the home is really just a short walk from several good restaurants, two lovely beaches, and a tiny market where you can stock up on drinking water or enjoy a fresh pipa (coconut water). The private pool was the highlight of this home for us. The roads in all of the Nosara area are very rough, but we had fun with ATV rentals to get around. The reason I give only 4 stars is because air conditioning was a hefty additional charge and coming from the northwest, we found A/C to be absolutely necessary. We were not informed of the additional charge until our arrival at the home, so I would advise fellow renters to be aware. We stayed at Paraisito in Feb 2017. Thoroughly enjoyed the villa - though thank goodness A/C was working because it was hot! Both main floor bedrooms were well-appointed and comfortable thanks to A/C. Kitchen is perfect for anyone looking to make simple meals. Pool is small - but was absolutely perfect after a morning at the beach or an outing - all 4 of us (2 adults, 2 kids) managed to hang out and cool down and even swim a few mini-laps. Would note that at least when we were there, it would have been way too hot to have anyone sleeping in the loft, as there's no functioning A/C up there - so good thing we were only 4 people and could adapt the main floor bedrooms to our needs. Thanks for a great stay! Our second visit here for two weeks was even better than the first time (we were here for a week in 2015). The addition of the pool, which we used many times everyday, and the rancho for dinner every evening were great additions. The house is well equipped and very comfortable for us as two couples. We took day trips to Playa Giones, Samara, Punta Islita. Some us had Tica massages, while others had an introduction to yoga, in spectacular settings. The quiet beach was only a short walk, for swimming and body surfing, and Olga's for coffee or lunch. The Howler monkeys provided hours of entertainment right in our backyard. The area suffers from serious drought conditions and the owners have installed a backup water system. We had a few small problems with it, but they were fixed promptly. We had a wonderful time and look forward to coming back again.